A lot of projects get made because someone just has the parts lying around. In this case, [Ed Nisley] got given a nice 8×8 RGB LED matrix, and needed something to display. [Ed] details the transformation of stuff-lying-on-the-desk into a unique matrix display for a Geiger counter (which he also presumably had sitting around somewhere). The result is a lightshow that’s as random as radioactive decay, and that’s pretty darn random. The first post covers the hardware layout. It’s build on protoboard, but ends up looking a lot nicer than our projects because [Ed] spent some time hiding the shift-register ICs and row-driver transistors underneath the matrix itself, which was nicely socketed above. 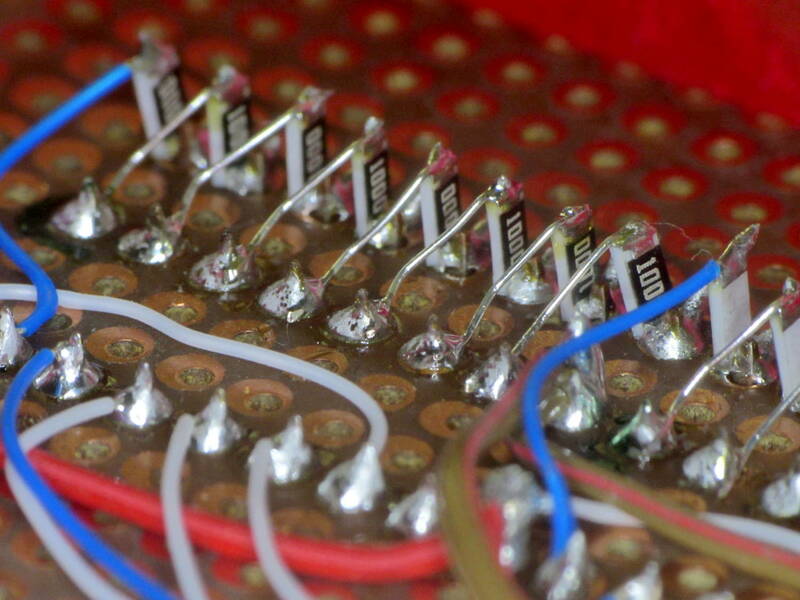 A sweet touch is the use of SMT resistors soldered upright underneath the board to save space. Cute. The third post starts to flesh out the software. [Ed] settled on seven colors (and off) for the display, so the matrix’s total state can be crammed into just 32 bytes, which fits nicely in even a tiny microcontroller, much less the gargantuan ATmega328. Wrapping this all up in an array of structs and providing a couple of helper functions makes quick work of the software side. 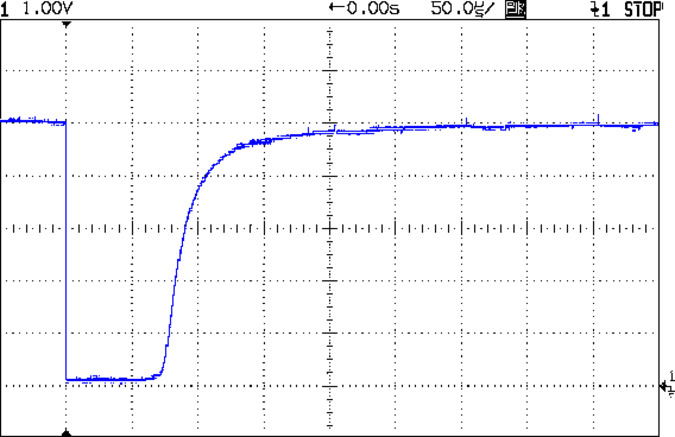 The addition of a sync pulse to trigger an oscilloscope at the end of a row is a nice touch. Next up is the Geiger counter interface software post. When a radioactive decay event is detected, the code reads out the time in milliseconds and uses that as the source of randomness. To whiten the noise, the times are run through a simple hash function: the Jenkins hash (link). This hash function was new to us and seems pretty useful for quick-and-dirty microcontroller applications. The last post details pre-loading the matrix on startup and running a test sequence that blinks each LED to make sure they’re all working. Using a single random value to seed a software pseudo-random number generator ensures that it will (almost) never start off with the same display twice. Phswew! That’s a lot of well-documented writeup of a well-polished project! Hope it inspires you to dig out something cool from your junk drawer and build. I like this guy’s style. After the apocalypse, everyone else is going to be staggering around with gloomy, industrial-looking geiger-counters, but he’s going to have the world’s only festive party geiger-counter. That’s the spirit. When life gives you nuclear winter, turn it into nuclear Christmas. If life ever gives you melons, you could be dyslexic. It will make an easier target. The Jenkins hash link is not there. I actually put a board together similar to this and was thinking about submitting to hack-a-day, but [Ed Nisley] beat me to it. now it just looks like I’m copying him..
though, he actually put his to use, and his code looks a lot better than anything I could have written up, so great job! Radioactive decay is a stochastic process (random). However, to use it as a source of randomness care must be taken because of its non-uniform distribution (Poisson distribution to be precise). One needs to find out the sampling period for which the probability of a single event is exactly 50% and keep watching it. Otherwise such random generator will be biased. It doesn’t matter for this application. It’s just for fun.